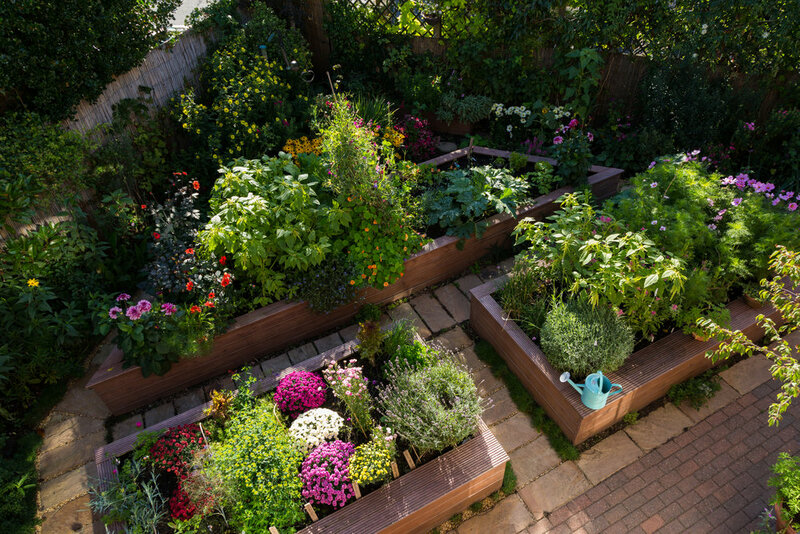 Raised beds are fantastic in modern gardens, so don’t think they are just for allotments! Here we take you through why we love them, how to design them and how to choose the best styles for your garden and budget. 1. 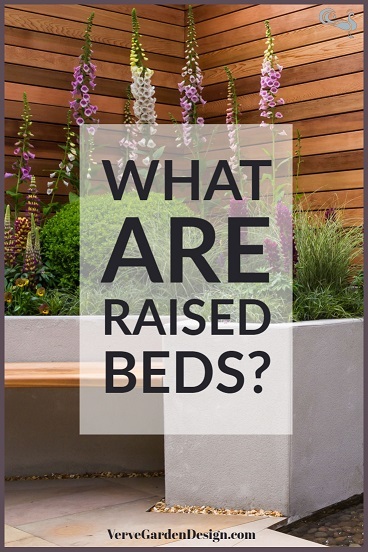 What Are Raised Beds? Traditionally, garden plants have been grown in ground-level areas of soil. The loosened soil in these garden beds is usually held in place by surrounding ground that has been uncultivated and compacted over many years. Raised beds use rigid, man-made boundaries to contain the soil in planting areas above ground level. These raised garden beds were once thought of as mainly rustic places to grow vegetables but they have now become deservedly-popular design features in modern gardens. The height of the beds you choose will depend on their use. Where your soil is shallow, simply increasing the depth by 10 cm can be enough. Where there is no soil, such as when raised beds are built on a patio, you will need a minimum of 15cm soil depth to grow anything (and likely more for most plants). However, for gardeners with bad backs or where the raised beds will double up as seats in small gardens, beds of up to 0.7m high are desirable. Around 0.4-0.5m is an ideal seat height, depending on how tall you are. 2. Why Do I Need Raised Beds? Rendered raised bed with built-in seat. Designer: Jo McCreadie. Image: Lorraine Young/Verve Garden Design. Why do I need garden raised beds? Image: Verve Garden Design. Raised beds offer practical solutions for modern householders as well as stylish additions to the garden. They can be built on areas of no soil or very poor soil. They allow you to plant over concrete or paving without removing it. 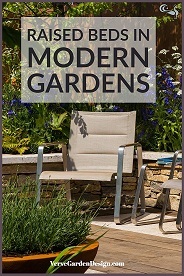 They can provide a sense of enclosure around a seating area in an overlooked garden. Beds in the same garden can be filled with different types of soil/compost to grow different plants. Raised beds improve drainage in water-logged areas. It can be more comfortable to work at a higher level rather than bending down. Weeding, watering, planting and mulching all become easier. Plants in raised beds can be appreciated more, especially by less mobile people or those in wheelchairs. They are versatile. Not all need to be filled with plants. Make one into a raised pond and another into a sandpit for the kids. They are useful for terracing a sloping garden. They are useful design elements for separating different garden zones. They can have built in seating - useful where space is limited in small gardens. Soil warms quicker in Spring so growing season is extended. Plants can often grow deeper roots than in the ground and so can be planted closer together for greater effect or veggie yield. Low, wood raised beds in Arne Maynard kitchen garden. Image: Lorraine Young/Verve Garden Design. Different styles of modern raised bed. Image: Lorraine Young/Verve Garden Design. One of the reasons that raised beds are such a versatile garden element is that they can be finished to suit almost any garden style. We have collated hundreds of gorgeous ideas for you on our Pinterest Board Raised Bed Gardens so do have a look. For more rural and rustic gardens, such as Arne Maynard's kitchen garden at his Welsh home, low wooden edges work well. For a more environmentally-conscious design, especially when growing vegetables, you may prefer timber such as cedar that is naturally resistant to decay to pressure-treated softwood. Notice that Maynard has added a lovely design detail of carved interim posts to his otherwise simple and beautiful oak bed edges. Other options for rural properties include cladding beds made from pressure treated timber or blocks with willow hurdles-expect these to last around 5 years. For a real touch of class, go for dry stone raised beds, using whatever rock is found locally and suits the exterior of your home. For modern or urban homes, brick can work well to blend in with the house exterior and clay bricks also look good with Victorian exteriors. Timber painted in a modern colour also works well. One of our favourites is to build your raised beds with blocks and then finish them with sheets or tiles of stone cladding. These can look wonderfully-contemporary in black or dark green slate or softer, beige coloured sandstones- there are many options available. A contrasting capping stone finishes the design off beautifully. Rendered block raised beds can look fabulous in modern properties but it is hard to find someone who can do rendering well. Also be wary of white- it can look good in well-lit magazine images (think sunny Greek islands) but can also look very out of place in wet UK suburbia in winter. Other options include rusty-coloured Corten Steel (shown above) that is strong and durable. This works well in both rural and modern properties. Gabion baskets filled with with a variety of options including pebbles and stone offcuts are another possibility- see our Pinterest Board Gabions for some inspiration. Corten steel raised beds. Designer: Patrick Collins. Image: Lorraine Young/Verve Garden Design. Wood raised bed kitchen garden made from deck boards. Designer: Lorraine Young. Image: Chris Denning/Verve Garden Design. Since raised beds are design features in their own right, you actually need smaller planted areas to make an impact than in ground level garden borders. Shape. Rectangles look good, but so do curves (including circles and waves) and hexagons. Size. Beds can really be as long as you like but make sure that they are no wider between the edge and the centre than you can comfortably reach. Raise your beds higher to get more light onto plants shaded by a fence, or where seating is desired, otherwise 15-30cm is plenty. Bed edges will need to be wide enough (and hence strong enough) to retain the volume of soil you will use. In my own kitchen garden (shown above), I capped the beds with 10cm wide deck boards so I could perch while planting, picking and weeding. On the front beds, I used a double width so I could perch more comfortably while re-potting seedlings or enjoying a cup of coffee. Number. Be careful to balance the desire for more planting area with overfilling the whole space. When plants are fully grown they make the space look busier than when the beds are first installed. Think about what you will plant in the beds before you make too many. Location. Decide on the best place to place your beds. Avoid areas that are too shady or they will end up covered in algae. Also avoid areas of splashing if your beds are painted or rendered or they will always look muddy and messy. Relationship. While choosing the materials, size and finish for your raised bed design, try to match (or contrast) with the house architecture or other features in the garden. Keep the beds in proportion to other features so they do not become too dominant. Access. Remember to leave enough access space around your beds to clean and maintain them. In a more functional kitchen garden, paved paths wide enough for a wheelbarrow are enough, but in a more decorative space, wider paths are more pleasing. Maintenance. Before you decide on a style and finish for your raised beds, please do the practical thing and think of the maintenance you are willing to do. Essentially nothing is "no maintenance" and don't believe anyone who tells you otherwise. Wood will fade in colour unless painted, stained or varnished. The cheaper the product you use, the more often you will need to re-apply (even good products fade in strong sunlight). Stone maintenance will depend largely on the porosity of the stone. Porous sandstones and limestones will attract dirt, small seedlings and, in damp places, algae. This will need to be hosed or scrubbed off by hand- power washing can be OK but can increase the porosity of poor quality stone. Brick, Corten steel and low porosity-stone will probably just need cobwebs brushed off and maybe a hose-down once in a while, so if you don't want to spend your well-earned-weekends with a brush in your hand, these might be better options for you. Cost and Lifespan. For most of us, design decisions don't come down to what we like to the look of, but more often depend on what we can (or are prepared) to spend. Cheaper wood products may be the only affordable option for you, but if you have a little leeway in your budget, try to balance cost decisions with desired longevity. In landscaping the phrase "buy cheap, buy twice" is so often very true. Poor quality wood products (or even good quality ones with cut edges inappropriately-sealed) may rot in 2-3 years. My own pressure-treated, end-sealed deck boards are failing at the base after 8 years and that is with an annual 3-coat varnish and a fair amount of TLC. Now if you only plan to be in the property for a few years, or use the raised beds for a finite period, then that might be fine. However, if your garden design is a longer-term, less hassle investment, then clad or rendered block, stone or brick might be a more cost-effective choice. If you do plan to sell the property at some point, buyers are more style-oriented these days and so a poor-quality finish might lose you a sale or some value. Capping. Flat-topped masonry bed walls are subject to water damage and so they need some sort of overhanging "capping" stone (also known as coping stone) to make sure that rainwater flows away from the bed walls. These look good in a contrasting material to the walls and can be made of concrete or stone. A wide variety of pre-made capping stones are available. In my wooden raised beds shown above, I used the grooved side of deck boards as a cap and these also direct water away from the wooden bed sides to extend their lifespan. Brick and stone raised beds at Broughton Grange. Designer: Tom Stuart-Smith. Image Chris Denning/Verve Garden Design. Might raised beds be a solution in your garden? Share your thoughts or concerns with us in the Comments Below!